The loyal, congenial, versatile Morgan is among the most beloved breeds of horses. Known as "the breed that chooses you," it's an exceptionally beautiful breed with a proud carriage and a drive to please. Adaptable to virtually any situation and use, the Morgan is an easy horse to keep and enjoy. The founding stallion of the breed was a horse named Figure, owned by Vermont schoolteacher Justin Morgan in late 1700. No one knows with certainty what Figure’s pedigree was, but it's generally accepted that he was the offspring of horses with Arabian, Thoroughbred, and perhaps Welsh Cob or Friesian bloodlines. As people heard of the elegant little Figure’s ability to out-pull and out-distance any other horse — and of his calm and intelligent disposition — he became a desirable stallion to breed in the New England states. The figure passed his desirable qualities on to his offspring, no matter what mare he was bred to. He eventually became known by his owner’s name, Justin Morgan, and contributed his qualities to breeds such as the Canadian, Saddlebred, Tennessee Walking Horse, American Standardbred, and American Quarter Horse. Over time, the Morgan became the ultimate all-purpose horse, equally at home in fine harness, on the race track, at work in fields, or under saddle. The breed standard of the Morgan horse is very specific and outlines the ideal qualities of the breed. The head is refined and chiseled, with large, expressive eyes and a wide forehead. The ears are short and well shaped, usually carried upright. The face is straight or dished and short, the nostrils large, and the lips firm. The throatlatch — where the head and windpipe meet — is wider than that of other horses, allowing for free, easy respiration; overall, the neck appears upright and strong, gracefully blending into a body that is distinctively compact, suggesting sturdiness and agility. The chest is well-muscled, and the legs should be strong but refined. The Morgan carries its tail high and straight. Overall, the Morgan's compact but powerful body type gives an impression of strength, athleticism, and elegance, showcased by a notably proud, alert carriage. Smaller than many other full-size horse breeds, Morgan horses average from 14.1 to 15.2 hands high. There is no strict standard regarding size, so horses may be shorter and taller. This hardy breed enjoys a lifespan longer than most; with proper care and in the absence of accidents, they easily live more than 30 years in good health. The original Morgan horse was said to have been able to out-walk, trot, or pull any horse. Since its beginnings, the Morgan has been the ultimate all-purpose horse, with a long resume of abilities and applications. Before industrialization changed the landscape of agriculture and transportation, the Morgan was valued as much for plowing the fields as he was for pulling the family buggy to church in fine harness. Morgans were used as trotting horses on the race track and cavalry mounts in wartime. They were hitched or ridden by pioneers as they set out on on the trail to settle the American West. They've also been used as cow and pack horses. Today, Morgans can be found competing in almost every equestrian sport, from endurance riding to saddle seat show classes. Morgan horse shows often feature sidesaddle classes, trotting races under saddle, driving classes, dressage, jumping, and more, all showcasing the unique, outstanding versatility of the breed. Morgans are usually dark, solid colors such as bay, black, and chestnut, but there is a wide variation that even includes pinto coloration. Some breeders specialize in producing Morgans with palomino, pinto, gray, dun, roan, and another less usual coloring, but there is no official breed standard for this aspect of the Morgan's appearance. The Morgan's strong, compact body and refined, neat top line are distinctive, as is the regal, proud way with which it carries itself. Proud and alert, they carry their heads and tails high and elegantly. The breed exists solely because it pleases people. The Morgan seeks a relationship with everyone he meets. He truly chooses to be with you. Whether nuzzling you through the barn door, sharing carrots on the trail, or giving you that knowing look of “We can do this!” in the show ring, the Morgan is part of your family and shares life with you. Figure had three sons, regarded as the foundations of the breed: Sherman Morgan, Bullrush, and Woodbury. All Morgans descended from them. When trotting races were popular in the 1800s, Ethan Allen and Black Hawk distinguished themselves on the track. Comanche, the only survivor of the Battle of Little Big Horn, was thought to be of Morgan breeding. In 1907, the U.S. Government established a breeding farm in Middlebury, Vermont, where these horses were bred for use by the United States Cavalry. 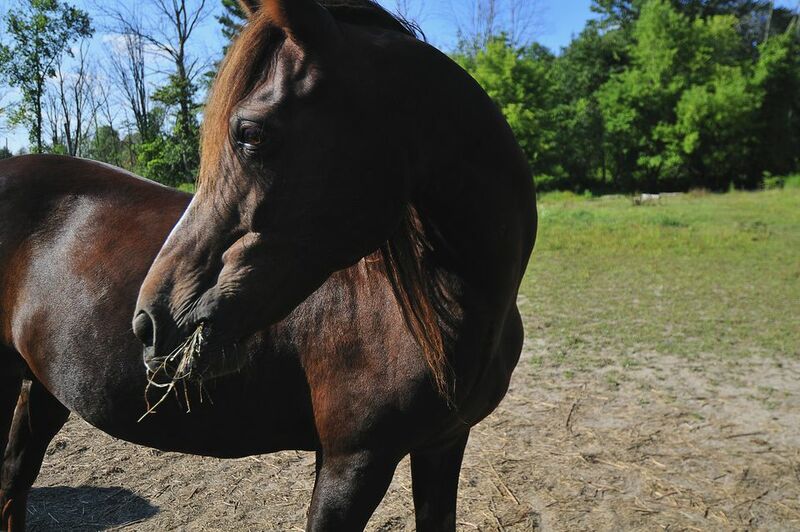 The Morgan horse was made the official Vermont State Animal in 1961 and is the Vermont State Horse. Is a Morgan Horse for You? The Morgan is a great choice for a family horse, particularly as a first horse or under the saddle of a beginning rider. In fact, there doesn't seem to be much this versatile horse can't do. They are suitable for many different disciplines in harness and under saddle, for nearly any job or function. They do what they are asked to do with what seems like pleasure and enjoy attention from their owners, caregivers, and admirers. These are outstanding companion horses who are happiest in the company of their human families. As for maintenance, they're known as easy keepers. They tend to be extremely healthy, with no tendencies toward leg or foot problems. They eat less than many breeds and are an economical choice in horses.